Get the ball into the hole with the minimum number of moves. Well, let me put it this way, who wrote this dog of a movie? Seriously it felt as if the gave the task to some young intern barely out of school because they knew the name would sell. 1. They spent too long chatting in the taxi. Also there were a number of places where the plot seemed to grind to a halt so the two heroes could exchange some platitude. 2. For the first part of the movie Bruce acts as if he has no idea what’s going on. It feels almost as if he’s playing a dog. Even though he hasn’t a clue wjhats happening, he steals a vehicle to chase after his son, crushng and beating up any number of innocent bystanders in his wake. 3. The shakey cam. Not as bad as some movies I might mention, At least this time I could see what was happening, but it was still bad. 4. Did I mention the script? 5. Some of the stunts were amazing, but they felt as if the Top Gear team had handled them. Seriously, the car filled with baddies hits a small ramp, and in the next shot it’s flying through the air. 6. 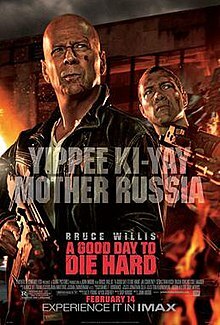 The Die Hard series has been getting worse and worse at this since the first movie. Seriously how many situations did they survive that in all reality no one should be able to? There were a couple of times I felt as if I was watching a remake of Last Action Hero. At least that was supposed to be OTT. I feel the Die Hard series might have run it’s course. Maybe when I go through it again tomorrow, it’ll get better.